We will discover a diverse actuality made of important museums such as the Picasso Museum in Barcelona and many small realities like the local library of Roquetes – all of them dealing, in many different ways, with our “digital revolution”. If it does not remind you of something familiar, it should. This particular interview wants to open a window (you choose how wide) on a cultural scenario not so different from ours, where the same challenges are faced and – frequently – the same incertitude. A world that is #openGLAM, the “GLAM” standing for Galleries, Libraries, Archives and Museums, the “open” for “accessible on a wider scale” thanks to a close collaboration with Wikipedia. Or better so, with Wikimedia and Wikipedians. A new species of the Homo Sapiens Sapiens? Not sure it’s not. 1. Àlex, you have been working for 10 years now as a digital project manager and a museum consultant (as shown in your rich bio). As similar professional figures are rare in Italy, it would be interesting to learn how you started. À. I started doing online project management outside of the cultural sector, doing project management and consultancy for financial brands and governments, but somehow my passion and my daily job got all mixed up at a time. 2. On the same line – trying to understand how things work outside of Italy – over the past 10 years, how did you witness the relationship between web & museums develop and change in Catalonia? That is, how are museums and cultural institutions approaching digital and social media? À. Catalonia has its own Cultural Ministry, and it has been some years now that most of the public museums adopted the same kind of CMS (Content Management System). This was good on the side of standardization but – as it always happens – it also had a “side B”: most of the Catalan museums are facing the same kind of basic problem. To be specific, it is hard for them to get their collections online. In Catalonia we have two types of museums: a small group of significant ones, with staff ranging between 20 and 200 people (MNAC, MACBA, Museu Picasso…), and a much larger number of museums which are facing this huge change to digital with a total staff average from 3 to 5 people. In these kind of small museums, the same limited group of people is in charge of directing, curating, creating educational programs… and now, in addition to this, of taking care of digital and social media communication. To be sincere… some of them are a little bit overwhelmed with all this. However, once they break the mindset, they soon realize social media is a shortcut to their audiences, and is a cheap way to build a committed community. You could easily tell, by their interactions, if they are still doing a one-way communication or if they are carrying on a real conversation with their audience. One other thing is that Catalan Museums must deal with 3 languages in their communications (Catalan, Spanish and English) and social networks like Facebook or Twitter are hard to deal with when going multilingual. 3. At this point we usually ask how the different social platforms are used by different museums to engage their audience. It would be hard to ask you how all Catalan Museums are taking advantage of each new media – nonetheless, it would be interesting to know, e.g., which platforms are the most used, and how. À. Facebook is by far the most used platform for museums. It is probably because is also the most used and most familiar website for museum staff in their personal lives. It is used for a day-to-day connection with the community. IMHO I think, however, that Twitter is a more influential tool. Most museums also have a Flickr account and some interesting projects are happening on Pinterest (for example, the Morera Museum is sharing its old exhibition posters via a Pinterest board). We also like how the Barcelona Archaeology service (@Arqueologiabcn) is explaining the city: they found a way of communicating even if they don’t have a physical venue to visit. Love it! The History Museum of Catalonia (@mhistoriacat) uses the hashtag #Onthisday (#taldiacomoavui) to reach a wider audience. A proof that this is a successful approach? Every month they lead the analytics facilitated by our friend Rui from @museum-analytics. It is a simple but useful trick. The @MACBA_Barcelona schedules thematic Tuesdays to dig into content from its collections and archives. Also a great idea. It would be better though if the topic was shared by more museums. 4. 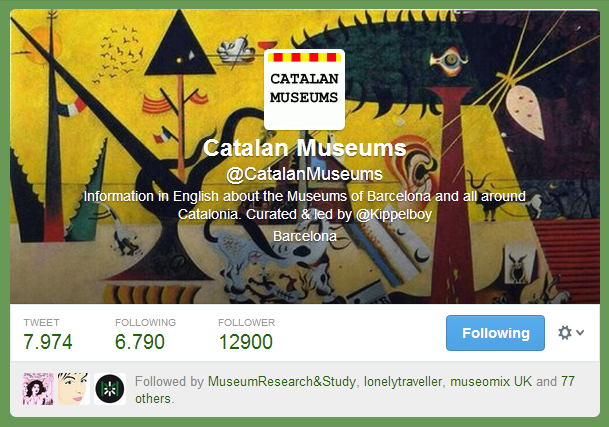 With the idea of helping the museums of Catalonia promote themselves and their work on Twitter, you created the account, and the project, @CatalanMuseums. How important is it, in your opinion, to build a network, and how does this influence the promotion of museums from all around Catalonia? À.This of the Catalan Museums is a personal non-profit project. Back in 2010 I realized that most of the Catalan Museums on Twitter where only tweeting in Catalan or Spanish. They were doing interesting things but weren’t focusing on a global audience. So I decided to create this project myself to share with an English audience the most interesting links to what was happening in Catalan Museums. I’m really happy that I’m helping them spread interesting projects, events and materials. And I prefer to talk about “community” rather than a “network”. IMHO, a network has more to do with the infrastructure that supports a community. You can have an inefficient network, but the real secret ingredient is feeding the community, being a member, really sharing and trying to help the others, let them be your neighbours, users, visitors or stakeholders. Once, the Librarian from Roquetes, a local Catalan village, told me: “I want my library to be useful to citizens, I want to help them. If we are a public resource, we need to be useful to the biggest percentage of local citizens”. Therefore, what she does is adapting the Library’s program and strategy to its neighbours and users. I simply loved it. When asked to evaluate the Catalan Museums project, I must say I’m quite happy with it. With it the museums have won a world presence, we have connections with curators of some of the major museums in the world, but we also try to help the casual tourist, and we share interesting projects from local museums with a more global audience, mixing local events and projects with our blockbusters like Dalí, Picasso or Miró. It’s all about balance. And the project is open: you can see here the language preferences of our followers. 5.Innovation, In-gallery engagement, openness: how are the museums in Catalonia approaching the emerging technologies (such as augmented reality devices, QR codes, mobile apps etc. ), and the current issues of open data and crowdsourcing? À. I believe that the approach is similar to that in the rest of European GLAMs. At first, technology itself was a goal. Some museums did an APP that was literally a copy of their website. Some have a love/hate relationship with QR codes. There have been some test experiences with Layar and AR (Macba, Mataró Museum). There is way for yet a lot of improving here. We are all learning together. 6. 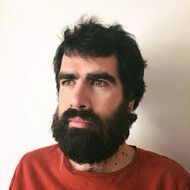 On 2011, you were declared “Wikimedia GLAM Ambassador”, which means you are collaborating with Wikimedia “in order to share multimedia content and cultural expertise” (to know more about Àlex’ project, click here and select “blog”). A quick look at the list of Italian projects tells us how this type of collaboration is fairly new (and possibly still largely unknown) in our country (although people like the volunteers of Wikimedia Italia are working on it). Could you explain to us briefly what it means to be a member of the #glamwiki initiative, and how the latter can help museums? À. Following ICOM’s definition of museum, museums should preserve, study and spread their collections. Professionals must keep being in charge of preserving and studying museum collections, but Wikipedia and its sisters projects are the perfect places for spreading the knowledge generated in a cultural institution. Let us consider this: a printed guide of a museum could maybe have 500-1500 copies, Catalan Wikipedia gets 30-45 milions pageviews… a month. Out of curiosity we nowadays google everything… and what does Google show us first? Wikipedia. How to work without a budget, how to start from zero? 7. Italian museums are starting only now to grow awareness of the usefulness of digital tools, but sometimes the main difficulty still resides in a critical lack of resources to invest in the field, or so people think. Have you ever worked with a low budget, and how did you make the most of it? À. We are VERY used to working WITH LOW or even NO BUDGET at all. It is not about the money. It is the engagement of the museum professionals what is important. When you need to explain something, you look for the easiest tool to do it. Technology is just another way of saying the word “tool”, and it needs to be understood as it – a tool. If paper should work better than a tablet in a certain exhibit, then using a tablet will not make the exhibit any better. 8.If you were to advise a small museum approaching digital media for the first time, as many in Italy are, where would you suggest they should start? (Let’s play a bit: tell us, at least, five mandatory things to do). Don’t try to be everywhere: Choose the platforms that are more suitable for you. On thanking Àlex for his precious contribution, we take the opportunity to state once again our #svegliamuseo! slogan, well aware that our “cultural battles” are the same others are facing all over the world, and that it is up to us to build a more global future through comparison and a constant dialogue. Let’s wake up – together!